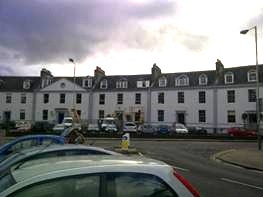 Leading Scottish accountancy firm, Morris & Young, is based at 6 Atholl Crescent, right in the centre of Perth. Known as ‘The Fair City’ since the publication of the story Fair Maid of Perth by Sir Walter Scott in 1828, Perth is notable for its architectural diversity and solid sense of history as it sprawls outwards from the banks of the River Tay. 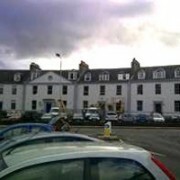 Atholl Crescent is a prime location near the Perth Playhouse, Concert Hall, Black Watch Castle and of course the River Tay. A majestic curve of white Georgian three-storey terraced townhouses, the accountancy firm shares the street with the RSPB, the Citizens Advice Bureau and a Masonic Lodge. The Crescent was built between 1797 and 1803, and offers a fine example of this period’s best and most handsome traditional townhouses. Around 18 months ago, the proprietors of the adjacent property notified the owners of No. 6 that there was a visible rot attack to the front right corner of the building, shared by both houses. 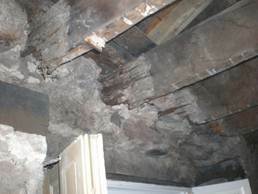 Initial operations were undertaken to halt the progress of the rot, but an exploratory survey earlier this year revealed both wet and dry rot to joist and rafter ends at ground, first and second floor levels. Typically of so many period properties, the damage had been caused over many years by rainwater ingress coming into contact with unprotected internal timbers and setting up ideal conditions to allow successful germination of wood-rotting fungi. 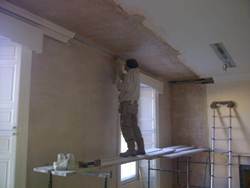 In a residential property, it is usually relatively easy to section off an affected area. It is also reasonably straightforward to request that the occupants reside elsewhere for the duration of the works. However, with almost 40 Morris & Young staff occupying the building, the partners were understandably loathed to vacate the premises. Fortunately, after due consideration the majority of the staff members were rehoused in temporary alternative office accommodation, allowing us significantly more freedom. Immediately we arranged removal of light fittings, electrical switches, wall mounted heaters and carpets. The servers for the property were positioned in the worst affected room so it was crucial that prior to any stripping-out works they were sectioned off with sealed partitioning. 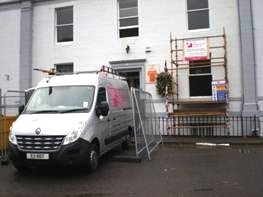 Scaffolding was erected to the front elevation of the property and we created a special opening access to ensure only a limited need to venture through to the rear of the property. In that way, all debris removals and timber replacements could be brought in and out using window openings and the scaffolding, thus minimising disruption to the few remaining accountancy staff. Fixing the problem itself was a considerable challenge, especially as we had to take into account structural strengthening works carried out to the front elevation due to previous settlement. While removing, repairing and renewing all decayed timbers with sterilisation treatments, we had to make a considerable effort not to disturb the masonry. 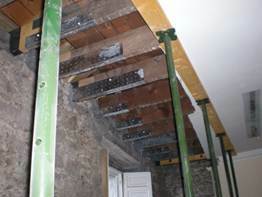 It was particularly important to ensure that all temporary supports were doubled and that only limited removal and re-instatement was carried out at any one time. We are delighted to report that the works are now complete and our clients are pleased that we worked perfectly to schedule – if not a little ahead – with minimal disruption. Taking advantage of the temporary relocation of most of their staff, Morris & Young have even decided to redecorate their offices as soon as we leave, so their employees will return to clean, fresh and most importantly safe surroundings. If you’re concerned your commercial property needs some attention, contact us today to see how we might be able to help.